Lose yourself in the rainforest design and setting of AWAY® Spa at W Singapore - Sentosa Cove, a luxury day spa showcasing award-winning signature therapies and treatments using ILA-Spa's organic and natural products. A mosaic wall in various shades of relaxing forest greens at the entrance to AWAY® Spa at W Singapore - Sentosa Cove complements wooden sculptures and natural surfaces, leading to a magical hideaway. 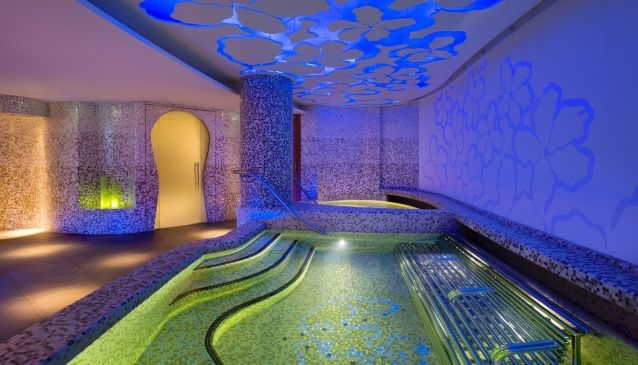 A decompression area, sauna, steam room, vitality pool, herbal bath, and experiential showers is warmly illuminated by hues of purple, orange, green and blue, a modern reality un-check of resplendent rest. In the treatment rooms, each with its own outdoor shower, expert and experienced therapists recharge your body, mind and spirit. Ease back into the real world on outdoor spear lounge chairs with vibration settings and built-in sound systems in a private garden while savouring spa snacks and beverages.